Camping: The nearest camping is at the Tamarisk Grove Campground, 10 miles west of Buttes Pass Road on Highway 78. 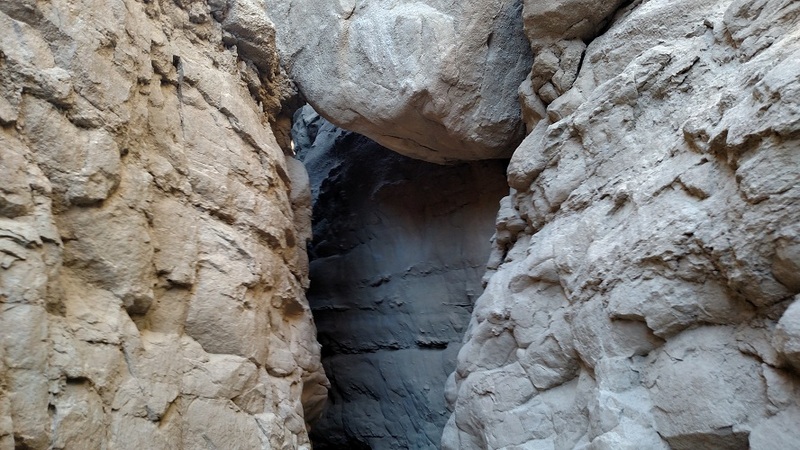 There’s nothing unusual about finding a slot canyon in the desert. What’s less common is finding a relatively accessible slot canyon that can be easily navigated without special equipment or expertise. 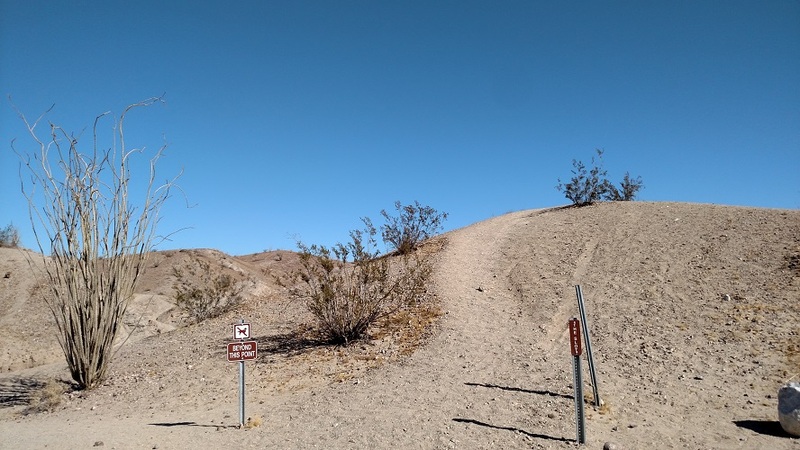 Such is the case with the Slot, which is becoming one of Anza-Borrego Desert State Park’s most popular sites. Here, hikers of all ages and experience levels can enjoy a unique destination, exploring a narrow, surreal canyon that provides a level of adventure rare in short hikes. From the parking area, you can look to the west and see what’s ahead of you: the gash of the slot canyon heading west through the desert with the Laguna Mountains in the distance. The “official” trail begins on the north side of the parking area, briefly climbing uphill before curving around and dropping into the canyon. The descent may be a little tricky; expect to use your hands as well as your feet. Once you are at the bottom of the slope, simply turn and head down the silt stone canyon. There are a few spots where you will have to negotiate rocks but nothing too hazardous. 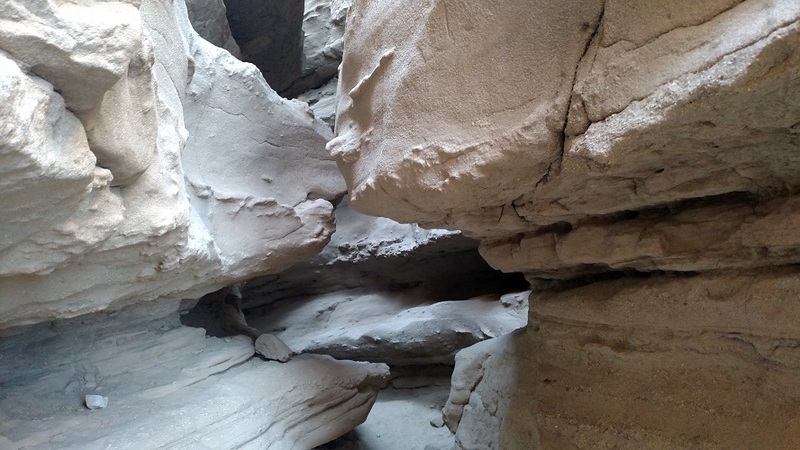 The walls soon start to pinch together and at one point, a boulder wedged above the canyon floor makes it appear as if you are entering a cave. Less than half a mile from the start, you reach the canyon’s most famous landmark: a diagonal slab of rock forming a bridge some fifty feet above. If the weather is hot or you are hiking with small children, this is a good turnaround point. The canyon continues for a short distance before opening up and reaching a dirt road. 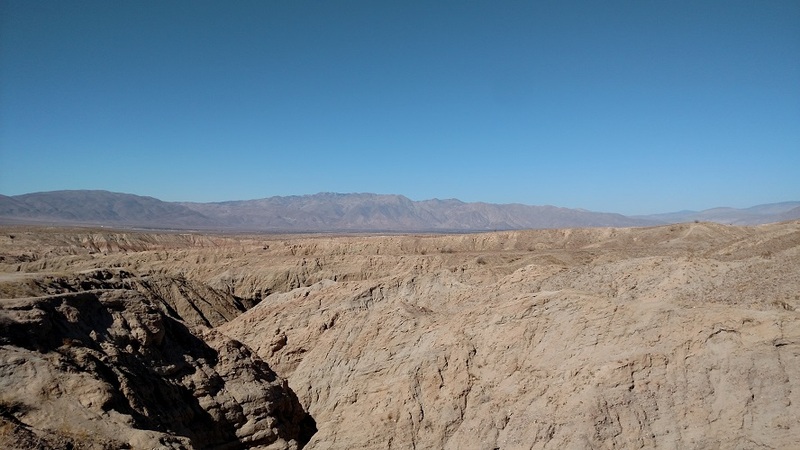 Ambitious hikers can work the trip through the Slot into a longer hike to West Butte Borrego Mountain. Text and photography copyright 2017 by David W. Lockeretz, all rights reserved. Information and opinions provided are kept current to the best of the author’s ability. All readers hike at their own risk, and should be aware of the possible dangers of hiking, walking and other outdoor activities. By reading this, you agree not to hold the author or publisher of the content on this web site responsible for any injuries or inconveniences that may result from hiking on this trail. Check the informational links provided for up to date trail condition information. Click here to request a customized list of hikes based on your location, desired level of difficulty and more. Follow NHLA on Instagram and Pinterest! Interested in writing a guest post for NHLA? Click here for more information. Give your feedback to make NHLA better: Take a survey! Click here to see the survey questions. Other hiking, travel and adventure sites! If you've found this site helpful and would like to help fund research for more hiking trips, please consider making a donation. Thank you! We are honored to have received awards from these great sites. Click the pictures for more information. Lost an item on a trail? Found one? Click HERE to notify the NHLA community. Nobody Hikes in L.A. Guidebook – click picture for purchasing info!